Are you searching for the source to get the complete information about the Interview Questions and Answers of All IT Companies at one place? Then you are at the right place to get the Interview questions for Technical and HR rounds. An interview is a conversation between the two or more people, in which the interviewer will check the skills of the interviewee. The candidates who had cleared the Written Test are hunting for the Interview questions. In this page, we have provided the both Technical & HR round Interview Questions for the sake of the candidates. These questions will help the candidates at the time of the preparation for Interview rounds. 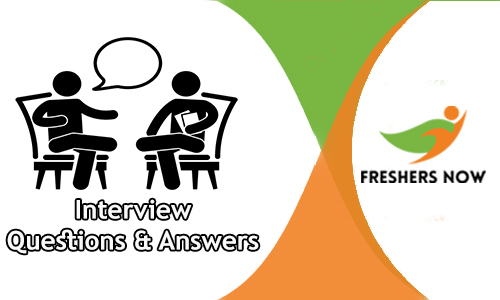 In this article, we are providing the interview questions for both the freshers and Experienced. So the Freshers and Experienced can go through the all IT Companies Interview Questions without any difficulty. Nowadays many of the aspirants are clearing the written test and unable to clear the Interview round. An Interview is a crucial round for the aspirants to get the job in any of the MNC or Startup companies. While preparing for the Interview, many of the contenders are thinking of how to answer various questions. The Interviewer will ask expected and unexpected questions at the time of interview round. For any question, the aspirant has to answer confidently. As the part of the Interview Process, the officials will conduct both the Technical and HR Interview rounds for the applicants. The aspirants have to clear both rounds to secure the job. In the Technical round, the candidate’s technical knowledge will test by asking various Technical Interview Questions on the core subjects. The aspirants who clear the technical level will allow for the HR Rounds. In HR Round, the aspirant’s attitude and personal questions will be asked. If the interviewee will impress the interviewer with the good answers then they will be selected for the applied position. So to help the aspirants in their preparation we are providing the Interview Questions and Answers of various companies at one place. Candidates who prepare according to the stuff will easily clear the rounds. Candidates who are looking for the Information Technology (IT) Jobs are frequently searching for the related information like syllabus & test pattern, placement papers, Interview questions of a certain company. On this article, we are providing the all the MNC companies such as Google, Microsoft, Yahoo, Cognizant, TCS, Infosys, Tech Mahindra, Wipro, Oracle, Capgemini, HCL, IBM, Dell, Samsung, Deloitte, CGI etc. On our website, we are providing the most commonly asked Interview Questions and Answers which help the candidates in their preparation for the Interview round. We furnished the Technical Interview and HR Questions separately on our web portal. So aspirants can visit our website and refer all the material without late. Most of the aspirants will worry about how to clear the Interview Rounds in the recruitment process. No candidate can predict the questions what will ask at the time of interview. But there are some basic standard questions that every Interviewer ask the candidates. If the aspirants prepare those questions they can easily answer in the Interview Rounds. To get more information regarding this article the aspirants can go through this page completely and refer. Candidates who are feeling fear can kick-start their preparation for the Interview process by using the Interview Questions and Answers given on our website. Few of the companies will recruit the candidates on the score in the Written Test and most companies will conduct the Interview Rounds for the applicants to check their knowledge. The present article helps the candidates a lot who are preparing for the Interview rounds. Generally, candidates are exploring on the internet for the Interview questions on the various websites. To help the aspirants and to reduce the search burden we updated the Interview Questions & Answers of various MNC and Startup companies in a tabular format. Going through the page the contenders can find every company Technical Interview and HR Questions for both Freshers and Experienced people. So this page is the good source for the aspirants to find all companies interview questions with fewer efforts. Our suggestion to the candidates is to be in touch with our website Freshers Now for the regular updates.